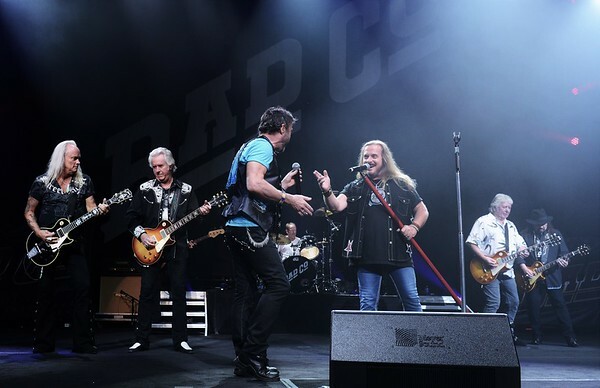 This exclusive photo of the Lynyrd Skynyrd-Bad Company encore in Bethel, NY 2015 was captured by RLP photographer Brian Evans. This was the final show of a 14-stop tour that we photographed at the request of management. Rock Legends Photographers share a passion for capturing the emotions of live rock and blues music concerts in photos to share with music fans everywhere. We connect the fans with the bands! Michael Yanko has been photographing rock concerts since the 1970s and was joined by his late wife Rina Marie Braley-Yanko (R.I.P.) in the 1990s. Together they created Rock Legends Photographers in 2008 to provide a public outlet to share their photography. Their work, along with several others, was shared through the Rock Legends Photographers website, "Real Rock News" magazine, the original "Beat Magazine" (now defunct, R.I.P. Richard McCauley) and "Concert Photos Magazine." In 2011 Michael and Rina were introduced to contemporary blues by Devon Allman, and in 2013 bluesconcertphotos.com was added to the mix as an outlet to reach blues music fans worldwide. In 2013 Michael started filming live music videos for the site, and in 2014 he started conducting exclusive video interviews with musicians and bands. When properly shared through social media, our crossover band photo posts reach more than six million music fans around the world! In 2016 Michelle Wilson came on board and brought to the organization extensive music knowledge and experience as a concert and CD reviewer for "Ink19" magazine. Michelle has natural talent in concert photography and very quickly mastered using professional cameras and lenses. She has become an elite concert photographer in addition to being a highly skilled writer. Typically Michelle and Michael photograph and share photos from 5-20 blues or rock band concerts and festivals per month. In addition to "Ink19" you'll find our most current work in "Concert Photos Magazine," "Live For Live Music," and of course here on our own website. In 2017 we decided there was a need to further separate our photos of different music genres and added www.southernrockphotos.com to our growing menu of concert photos. Unlike most concert photographers, we actually promote the concerts, bands and venues where we will be shooting. Our extensive social media exposure reaches a mass audience of music fans that typical advertising does not. We help increase ticket sales and music cruise cabin bookings while also successfully boosting exposure for up-and-coming bands. Over the years we have become friends with thousands of artists, bands, agents, managers, promoters, publicists, venue owners, record labels, and music fans. We have photographed hundreds of festivals, thousands of concerts, and nine music cruises! Follow our adventures on Facebook, and join us to share your own adventures and photos in our Facebook groups Rock Legends Photographers, Blues Concert Photos, and Blues Festival Photography. Rock Legends Photographers is trademarked nationwide. We also own A Better DJ and Photographer, providing you with top notch DJ-MC services and spectacular photography for your wedding, party or event at great prices nationwide. Call us to help you make your celebration the best one ever!